Navin R. Johnson: Nothing? Are you kidding? Page 73 - Johnson, Navin R.! I’m somebody now! Millions of people look at this book everyday! This is the kind of spontaneous publicity - your name in print - that makes people. I’m in print! Things are going to start happening to me now. So to get to the point, what does a Telco 2.0 do to make Phone Book 2.0? The implication of the question is that you’re in a relationships and personal communications product business; the pipes and business platform are secondary. In the last few years, many telcos came to the conclusion that the link to the pipes was so tenuous (and the need to raise money to service debt so acute) that they spun off their profitable directory businesses as a non-core asset. Now, some are regretting that decision as Google and eBay reap in the profits from the next generation of business directories, and social networking sites explode. Telcos ate their seedcorn. It costs a lot to produce and distribute. The younger demographic isn’t really into paper-based media, or landline phones. “One very large size fits all”, with no personalisation beyond general geographic region. It’s out of date before it reaches your door, and doesn’t improve with age. It’s too big to move anywhere once you’ve got it. It probably isn’t right there at the point of consumption of the telephony service, but hidden on an obscure shelf. Supports limited search options: alphabetic by surname for residential users; company classification plus alphabetic order within each category. No meta-data, such as reputation. About half of residential users opt-out and aren’t listed. A similarly damning list could be compiled for notebooks and pencils compared to tablet PCs, but the relative adoption tells a different story. So having covered the weaknesses, how about the strengths? It offers an important signalling mechanism for vendors to express confidence in their business by buying larger adverts. The fact that paper and distribution costs something is a feature as well as a bug. Transparent business model: they pay us, we show you. Trusted to be impartial in who is listed (only as good as their money). It works “out of band” — you can look up numbers easily whilst already on the phone; indeed, “no batteries required”. Simple user interface, universally understood; no capital investment or compatibility issues for the user. Let us assume that delivery of some physical artifact continues for some time, and that Phone Book 2.0 isn’t a purely digital phenomenon yet. It just evolves and integrates with that online world, just as you might photograph a whiteboard after a brainstorm session with a digital camera. It’s like with all books: they’re still 99.999% on wood pulp, but Amazon has changed the way we find them. Public reaction shows that an all-digital future is some way off. So could we preserve some of the benefits of paper whilst injecting the values of a Telco 2.0 business? What opportunities are there to create a better product? Firstly, we must recognise the paper phone book for what it is: a physical medium; one with a flexible format (you can tear out bits and scribble on it); and a companion service to your current telephony for introducing consumers to businesses (“analogue Google”). What is the business objective of our re-design? As well as being an advert business, its job it to induce network traffic, transactions and premium service fees. It’s also part of an emerging identity business, where you broker data and establish trust between parties. For the commercial (yellow pages) part of the phone book, you can see several possible changes. The physical medium lends itself to dismemberment through perforated pages. If you make it easy to rip out adverts, these are more likely to become coupons or pull-and-keep driving directions to merchants. Like any magazine, there’s also an opportunity to have inserts that are easy to take with you. You can personalise these inserts at a lower cost than personalising the whole phone book. Every insert entry can be given a URL, but made short (as with services like TinyURL) and passing through the yellow pages directory provider. One way of doing this might be “http://ypag.es/<merchant phone number>”. This then becomes a bootstrap into offering richer services between merchants and consumers, as users can initiate calls from the web site (using ringback or VoIP) and have a better user experience that doesn’t involve having to dictate personal details already known to the directory provider. 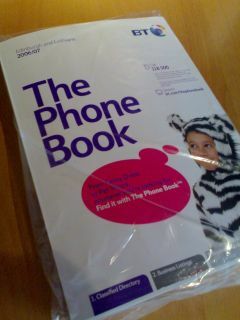 The BT phone book promotes their own directory service on the cover. But what advantage does it offer the user? If it doesn’t populate your network address book, or they don’t have a customer relationship with you that’s captured your mobile number to send you an SMS, all they’re left with is brand — an expensive illusion to maintain. There’s also a failure to learn from Internet players here. eBay makes it safer to interact with strangers by using reputation; credit cards offer protection (often above that legally mandated) and extended warranties on goods. By failing to mediate communications between users and merchants, or add value, the directory provider is cutting themself off from the most profitable parts of the transaction. Discovery was only the beginning of the process. The residential portion of the book could be used as a bootstrap for other business. The directory can be a companion to a website. People who wish to have their numbers unlisted can opt to have an “access code” printed instead; “Smith, Bob 23 Orchard Close X278HBV. These access codes (or landline numbers) can then be entered into the website for additional details on the user. You might be able to fill in a web form (for a fee?) and send the person an email. Yet the recipients’s privacy is protected. Privacy is likely to be a growth business. Perhaps you can offer to sell people a second number for the directory, one that will always go to voicemail in the first instance? People should be able to update and extend their own listings. Each phone book would have a pre-paid return postcard to supply your extra details and preferences. One part would be to capture presence data and other channels to the user — their Skype, MSN or Yahoo IDs, for instance. This is important data to merchants wishing to return calls to users. For a company like BT, merchants should also be able to send voicemails directly into your voicemail inbox without disturbing you. No doubt there are other, possibly better, optimisations to the business model. The market may only mature slowly and not all will be cost-effective right now. But collectively, the need to engage in presence, transaction, identity, privacy and other business model extensions is imperative if the phone book business isn’t to pass away with its aging users.